ReCrystallize Pro Web Wizard for Crystal Reports makes viewing your Crystal Reports in a web browser quick, easy, and affordable. Use the links above to learn more about ReCrystallize Pro, view sample reports in your browser, and download a free trial version. If you are licensed for version 14.2 or newer, please proceed to the Activate option in ReCrystallize Pro for immediate online activation using your license ID and password. Completing the form on this page is not required for version 14.2 or newer. 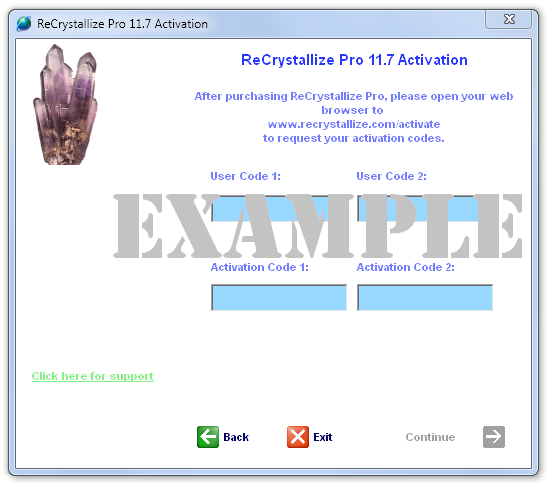 If you have purchased ReCrystallize Pro version 14.1 or older, please use the form below to request your activation code after installing or reinstalling the software. Requests submitted here receive highest priority and are typically processed within 4 business hours (US Central Time). Please note that support agents and customer service representatives cannot provide activation codes via telephone. Required information from the installed copy of ReCrystallize Pro is detailed below. We can provide a valid activation code only when all required information has been accurately supplied. When you receive your activation code via email, please enter it as Activation Code 1 and then click Continue. Can't wait? Our new online licensing system can activate ReCrystallize Pro immediately. Upgrade now to the current version of ReCrystallize Pro at a discounted price. Do you know? ReCrystallize Pro version 14 makes your Crystal Reports viewable in any web browser — including iPhone, iPad, and Android devices — without requiring ActiveX or Java add-ons? No need to change your Crystal Reports version or your .rpt files. Version 14 still fully supports classic ASP with the ActiveX and Java viewers, just as in previous versions. It adds the option for ASP.NET with broader browser compatibility. Version 14 works with older versions or Crystal Reports while adding full support for the latest Crystal Reports versions. Click here to learn more or see examples using the ASP.NET report viewer. Apply code UPGRADE in the shopping cart for the lower upgrade cost. Please note: Recent versions of Windows often cause ReCrystallize Pro's User Codes to change, resulting in a failed activation. Before providing User Codes below, please start ReCrystallize Pro by right-clicking and selecting Run as Administrator. If possible, leave ReCrystallize Pro open to the activation screen until you receive and apply the activation code. Reason -- Please select --Extend evaluation period.Initial activation code for a recently purchased license.Transferring license to another developer -- please deactivate existing license first.Hardware failure / new computer.Adding a developer under a multi-user or site license.Free upgrade.Upgrade covered under 12-month subscription.Deactivate license.Other -- please provide details below. Please provide the exact version number and User Codes that the ReCrystallize Pro program installed on your PC currently displays on its Activation screen. The image above is for illustration only. User Codes change between installations. Your old User Codes will not allow us to provide correct Activation Code for your current installation. Copyright © 1998-2018, ReCrystallize.com LLC.